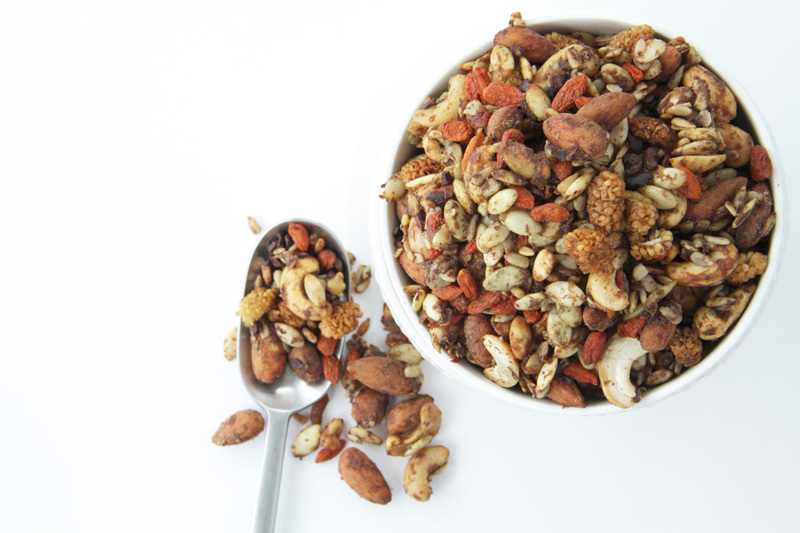 Combination of nuts, seeds and dried fruit can certainly provide a wonderful nutrient-dense snack But be aware! Most packaged trail mixes you will find in stores are far from healthy. 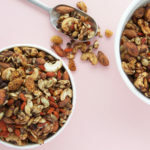 Often they are nothing more than salty nuts roasted in unhealthy oils, mixed with pieces dried fruit often double (or even triple) coated in sugar. Doesn’t sound that healthy, does it? But here is the good news. 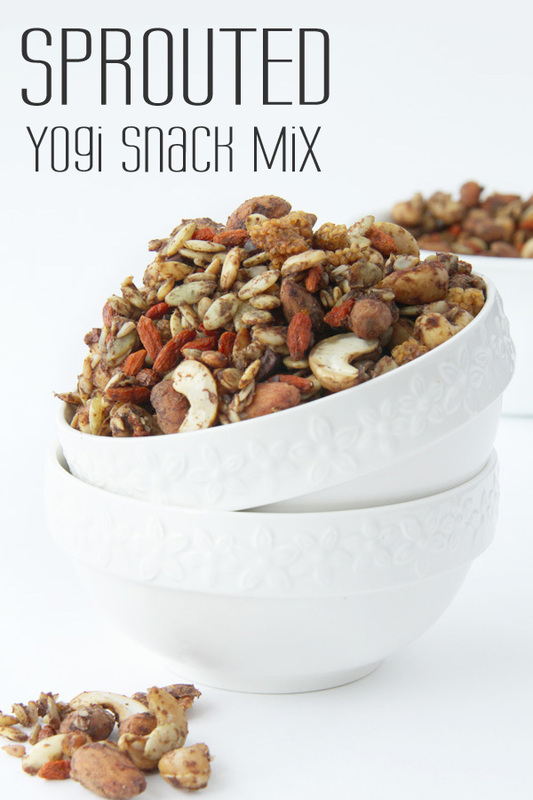 For any of you who are active or those who are just busy and need a healthy, quick grab and go snack, this easy to make Sprouted Yogi Snack Mix can provide a great solution. 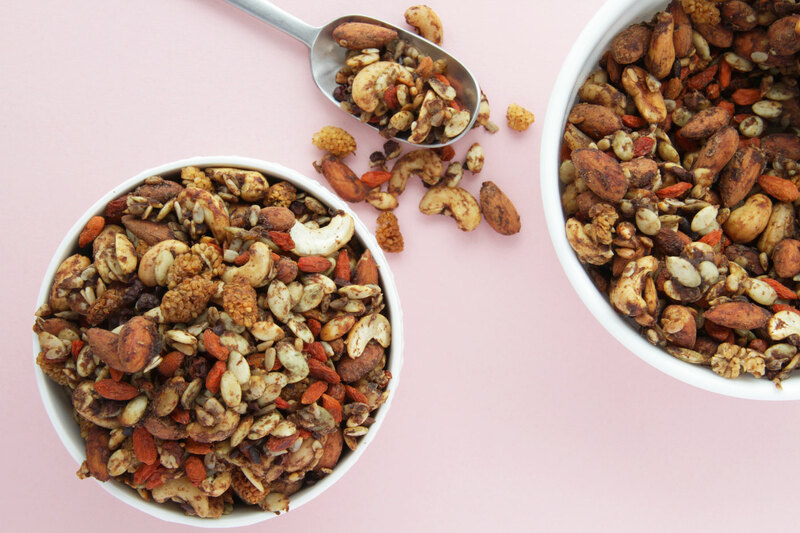 Nuts, seeds, legumes and certain grains can be a wonderful nutrient-dense food, however they also can interfere with the body’s ability to absorb nutrients and often cause inflammation. This is due to their coating called phytic acid and enzyme inhibitors. These act almost as nature’s body guard that keeps the nut or seed safe until germination is ready to occur. Now, this is also the reason and cause of physical distress in our bodies. As mentioned above, these enzyme inhibitors and acids stop nutrients from being absorbed and irritate our digestive tracts often contributing to irritable bowel syndrome and whole host of other digestive issues. Soaking and sprouting nuts, seeds, beans, legumes and grains will allow you to get the most health benefits from those foods and help you avoid a lot of potential digestive and health challenges. Goji berries, also known as wolfberries, are said to be one of the most nutritionally-rich fruits on the planet. Their health benefits include longevity, vitality, and energy. A good source of potassium, iron, and selenium, they also have B vitamins, calcium, zinc, fiber and even protein. Raw cacao nibs are simply pure cacao beans ground into small pieces and offer an incredible health food in its natural state, Loaded with minerals such as magnesium which may contribute to normal bone health and healthy immune function, cacao is also high in copper and manganese. MAKE AHEAD: Soak nuts & seeds in a large pot of water overnight. In the morning rinse and drain the nuts & seeds well and place them in a dish or shallow bowl, on the counter top or somewhere where they will be exposed to air. Allow them to sit for al least 3 hours. Preheat oven to 250. Now it's time to make your paste. In a food processor, magic bullet or high speed blender, add all the coating ingredients (dates, vanilla, cinnamon, maple syrup, garam masala and sea salt).Process all until you get a smooth paste. If needed add 1-2 Tbs hot water. Add the paste to the bowl with mixed nuts an seeds and mix well. Spread this mixture on a large baking sheet (or 2 smaller ones). Place the baking sheet(s) in the oven and set timer for 60 mins. When the timer goes off, pull the baking sheet(s) out of the oven and mix in goji berries, mulberries and cacao nibs.Place back in the oven and bake for another 30 mins, or until everything looks slightly toasted but not burned! To store, keep in glass mason jars (or other glass containers) in the fridge or freezer. These will keep for at least one week.